What are the Benefits of Choosing a Battery-Operated, Magnetic-Mount Rotating Safety Beacon? High-visibility rotating beacon lights have been demonstrated to increase workplace safety on job sites. Safety signals have become so useful that today’s work sites are lit up like dance clubs. Every vehicle on the site is likely flashing in amber, clear, red, blue, green or some combination. So, why would a portable, battery-operated safety light be needed? Equipment: While company-owned work trucks are likely fitted with safety lights, most portable equipment like generators, small excavators, trailers and other construction equipment do not have built in safety lights. This equipment is expensive. Protect it while it is deployed on a site by attaching a portable, magnetic safety beacon to any metal surface. The bright, rotating light will add extra visibility on a busy site. Power Line Visibility: Dangerous overhead power lines are usually well noted with signage. But, like most signs, they can be easily overlooked when a worker is focused on completing their task. Attach a portable warning light to the sign to grab more attention as workers operate in the area. Personal Vehicles: Is the company vehicle in the shop and you still have to work? A portable, non-permanent light can be affixed to your personal vehicle to provide it the same visibility for safety as your trusted work truck. Do you have employees parking at the site near heavy equipment and machinery entrances? Issue the employees a portable light to keep their vehicles safe. When the employee no longer needs the light, you can assign it to another employee. A battery-operated beacon used this way can save on installation costs and avoid any permanent damage to vehicles when mounting them. 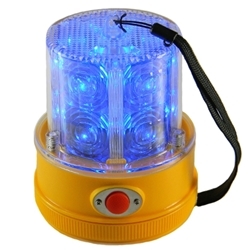 Warning Light for Dangerous Conditions: When a hazardous or dangerous condition develops and you need to keep people away, you can quickly bring attention to the area to avoid by installing a portable safety beacon. When the conditions have been returned to normal, you can take the light with you for another purpose. What Features are Available on Portable Safety Lights? High-Visibility LED Lights: The LED lights in these signals are extra bright and will provide plenty of visibility in both daytime and nighttime applications. No Moving Parts: The light rotation is simulated by timing the on/off cycle of the LED light rows. With no moving parts, there is no chance of mechanical failure. Battery-Operated: The safety beacons operate on common “AA” or "D" size batteries. The LED lights use little power. In our own tests, some of the beacons operated continuously for 4 weeks, 24/7 on one set of batteries. Built-In Magnetic Mount: Strong magnet mounts to metal surfaces with ease. Remote Controlled Versions Available: Turn on and off the safety light at a distance. Adjustable Rotation Speed: It is easy to adjust the rotation speed by just turning a simple screw. Multiple Colors: The FT-PL-300 lights are available in Amber, Red, Blue and Green. The NA-PSLM275 lights are available in Amber, Red and Blue. 110V Wall Adapter Available: If you find a need to use the light with standard household 110V power, a separate adapter with a plug is available for the FT-PL-300 lights. Watch the videos below to see the portable safety lights in action.